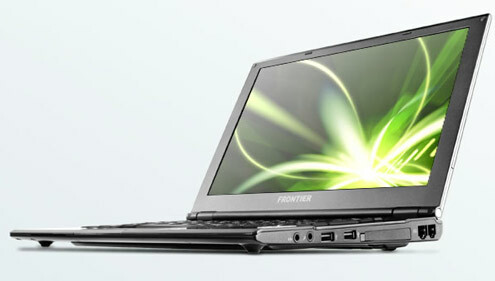 Kouziro’s Frontier line of laptops has just been augmented by the 1.24kg FRLN series of ultra-lights and – for budget machines – they’re incredibly well specced. For just ¥130,000 ($1,250), the entry model comes with an 800MHz Intel A110 processor, 1GB of RAM, an 80GB hard drive and a 12.1-inch LED-backlit screen. The OS is Windows XP Home and battery life is 4 hours, extendable to 8.5 with an optional battery pack. Although good for the price, there’s nothing in that lot to write home about. That, however, comes in the shape of a 12.5mm body (at the thinnest point) that still manages to include a healthy hand of ports (check out the photo gallery here). These include a PC card slot, a D-sub monitor connection, a 56K modem, a LAN port, a multi-card reader and three USB ports. Not only that, but the FRLN also has a fingerprint reader, a smartcard slot, a waterproof keyboard and can survive a fall from 1m onto concrete. Looks like those Japanese claims about being able to built a better subnote than Apple weren’t just idle boasts. We’ll take two please.